Each spread features a new constellation: on one side we have information on its location, stories and myths, and a key for how to find it in real life, and on the other side we have an image of the star cluster and an artistic rendering of what the constellation represents/how it got its name. So for my favorite constellation Cassiopeia, we learn that she's in the Northern Hemisphere, we can see her best between September and December, and she was named after a vain queen from Ethiopia. There is also some front and back matter with sky maps and information for further reading. The design of this book is absolutely exquisite. The entire book is done in Pantone blues and golds, so the colors are very dense bright. The dust jacket has shiny gold foil and tiny, laser-cut pinholes that peek through to the casewrap; in turn, the casewrap features the milky way in varying shades of gold, so looking through the pinholes with the jacket on makes the holes look like golden stars. Think of all the design work that went into lasering pinholes so precisely on every constellation! You can see it all better below. 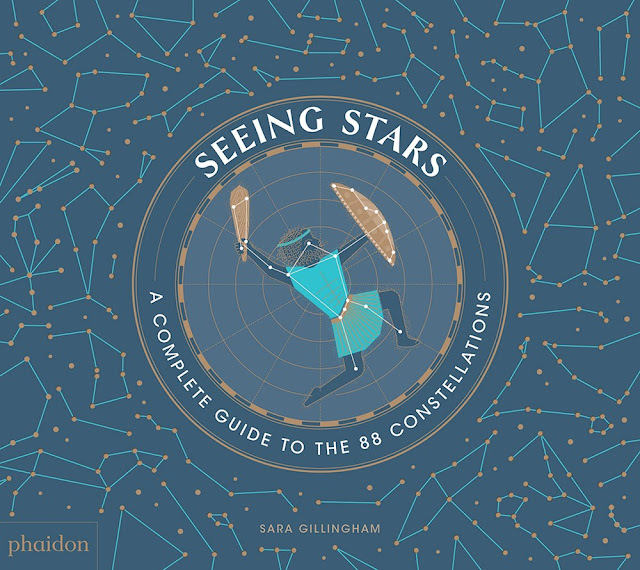 Seeing Stars: A Complete Guide to the 88 Constellations published from Phaidon Press last week. And here's a peek under the dust jacket!